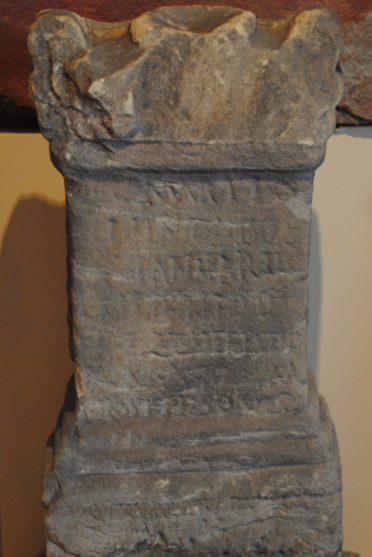 On display in the visitor centre at Brougham Castle is the above altar which dates to the 3rd century AD. Constructed of white sandstone, the altar features a carved patera (a small frying pan) on the left hand side and a jug. On the right hand side there is a carved axe and a knife. The inscription reads “To the God Mars…Januarius…of the unit of Stratonician cavalry deservedly fulfilled his vow for himself and his family.” Stratonicaea was a town in Asia Minor and the Stratonician cavalry originated from this part of modern day Turkey. The altar dates to the time of the Roman fort and settlement Brocavum which was based at Brougham from circa 80AD until the 5th century AD. The presence of the altar indicates that the cavalry unit was stationed at the fort during the 3rd century.